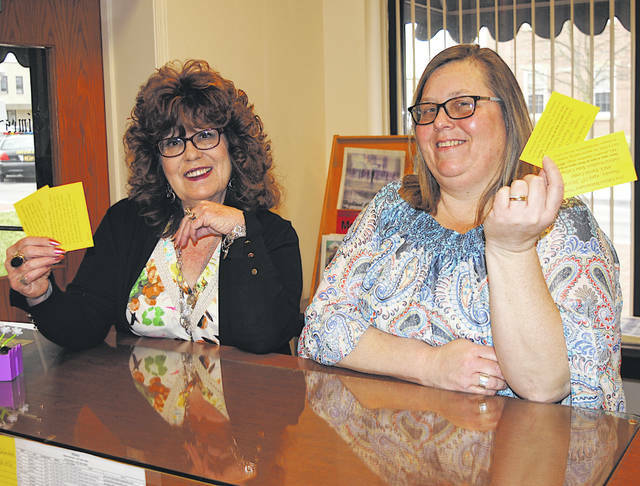 The Times-Gazette’s Sharon Hughes, left, and Ann Runyon-Elam display tickets for the 31st annual Homemakers Show that will be held April 25 at the Southern State Community College Patriot Center in Hillsboro. Tickets are now on sale for The Times-Gazette’s 31st Homemakers Show that will be held Thursday, April 25 at the Southern State Community College Patriot Center in Hillsboro. Tickets are $7 each, cash or check only, and can be reserved by calling 937-393-3456 or stopping by the newspaper offices at 108 Gov. Trimble Place in Hillsboro. Those attending the show are asked to remember to bring non-perishable food items that will be donated to the Highland County Homeless Shelter in Hillsboro. Anyone bring five non-perishable items will receive a door prize ticket and those donating 10 non-perishable items will receive three door prizes tickets. Homeless shelter officials have said the food donations at the show represent their largest collection of the year. Everyone attending the show must have a ticket, regardless of age. There is no reserved seating, refunds or exchanges, and the newspaper is not responsible for lost tickets. Vendors wishing to participate with booths or tables can reserve spots by calling 937-393-3456. “Come prepared to shop from our vendors and check out lots of free samples,” said Hughes, Times-Gazette media director. This year’s presenters will be SSCC President Dr. Kevin Boys, Times-Gazette reporter Tim Colliver and his daughter-in-law, Sami Colliver, making a presentation tentatively on homemade apple cobbler, and possibly another act to be named. Local entertainer and longtime radio personality Herb Day will be back by popular demand. Around 100 gifts and door prizes will be given away throughout the show, and there will be a variety of food to sample. The doors will open at 3:30 p.m. Those attending can visit with the 40 or so vendors before the show starts at 6 p.m.
Highland District Hospital will greet everyone with a bag and a gift, and Highland County Sheriff Donnie Barrera will join other volunteers collecting food prior to the start of the show. Hughes and Leslie Ramsey of WVNU will be the co-hosts. Hughes said there will be new and exciting additions to this year’s show.